OTTAWA - The federal government's rationale for trying to deny Canadian citizenship to the Toronto-born son of Russian spies leads down an "absurd and purposeless" path, the young man's lawyers argue. They're asking the Supreme Court of Canada to dismiss the government's application for a hearing of the legal issues at the heart of the strange espionage saga that has left Alexander Vavilov, 23, in limbo. Accepting the federal position "would result in uncertainty about an individual's fundamental right to citizenship," Vavilov's counsel say in a brief filed with the high court. The Supreme Court will announce in coming weeks whether it's going to hear the case, though no date has been set for the decision. The government is appealing a ruling that returned Canadian citizenship to Vavilov after it was revoked by Ottawa. Vavilov, 23, was born in 1994 as Alexander Philip Anthony Foley to Donald Heathfield and Tracey Ann Foley. The following year the family - including an older boy, Timothy - left Canada for France, where they spent four years before moving to the United States. The FBI turned up at the family's Boston-area home eight years ago. In all, 11 people - four of whom claimed to be Canadian - were indicted on charges of conspiring to act as secret agents on behalf of the SVR, the Russian Federation's successor to the notorious KGB. Heathfield and Foley admitted to being Andrey Bezrukov and Elena Vavilova. The FBI said Bezrukov had based his cover identity on the birth record of a baby with the surname Heathfield who died in Montreal at the age of six weeks in early 1963. Bezrukov and Vavilova were among those sent back to Moscow - part of a swap for prisoners in Russia. Alexander finished high school in Russia, studying in English. He changed his surname to Vavilov on the advice of Canadian officials in a bid to obtain a Canadian passport. But he ran into trouble at the passport office and in August 2014 the citizenship registrar informed Vavilov the government no longer recognized him as a citizen of Canada. The registrar said his parents were employees of a foreign government at the time of his birth, making him ineligible for citizenship. The Federal Court upheld the decision two years ago. Last June the Federal Court of Appeal set aside the ruling and threw out the registrar's decision. It said the provisions of the Citizenship Act cited by the registrar shouldn't apply because Vavilov's parents did not have diplomatic privileges or immunities while in Canada. In its application to the Supreme Court, the federal government says the registrar's original decision was "rational and defensible." The appeal court's interpretation, on the other hand, means the legislative provisions in question deny citizenship to children of foreign intelligence agents posted to an embassy and benefiting from diplomatic privileges, while allowing citizenship for children of undercover intelligence agents engaged in surreptitious espionage. In their filing with the Supreme Court, Vavilov's lawyers say the government's view of the Citizenship Act is unreasonable and would lead to absurd outcomes. Aside from diplomatic or consular officers, many foreign governments employ people in Canada through a wide range of state-owned enterprises including banks, airlines, energy companies and other national ventures, they point out. The government's stance would expand the exception to citizenship by birth to encompass all children born to parents working for such employers. "This would mean, for example, that children born to employees of foreign private oil companies operating in Alberta would be Canadian, while those born to employees of state-owned oil companies would not," the submission reads. "Similarly, children born to employees of foreign private airlines working at Canadian airports would be Canadian, while children born to employees of state-owned airlines working in those same airports would not. "These results are absurd and purposeless." Limiting the exception to citizenship to children born to foreign officials or employees who enjoy diplomatic immunities and privileges provides far greater certainty, Vavilov's lawyers conclude. In a reply, the government characterizes the examples as "hypothetical scenarios" that "would undoubtedly be more complex and benefit from this court's guidance in the present case." Timothy Vavilov, 27, also went to Federal Court after being stripped of Canadian citizenship, and the outcome of his case could ultimately hinge on the result of his brother's proceedings. 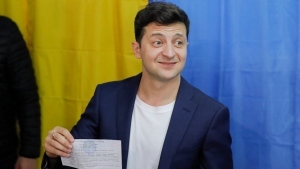 Prime Minister Justin Trudeau issued a statement congratulating the new president-elect of Ukraine, Volodymyr Zelenskiy.